Noricks started PR Couture five years ago while in graduate school. According to her book, she felt frustrated with the lack of information available about fashion PR. Since then, Noricks was sponsored by Microsoft to attend New York Fashion Week, was one of the first bloggers invited to cover WWDMagic and Teen Vogue’s trade show, and has taught fashion communications classes. Ready To Launch features advice and tips for anyone looking to break into fashion PR from someone who has almost 10 years of experience in the field. While I’m not a student anymore, nor do I work in PR, I appreciate what Noricks offers her readers: a succinct guide to getting your foot in the door. This book reminded me the ones I read in my communications or marketing classes in college, but better. At 120 pages, it’s not too long that it dragged on and on and on (a student’s worst nightmare…), yet it offered enough substance that I was satisfied. Noricks offers her tips in eight chapters, an introduction/”about me” as a prelude, and a wrap-up chapter before a glossary of terms. Reading how she eventually got to fashion PR is fascinating and will be very comforting to see in the eye’s of a student. Her experiences in agency life, in-house PR, and freelance work gives Noricks the kind of credibility you look for in books like this, but without the inflated ego. She starts with the basic distinctions between public relations, advertising, and marketing, a chapter which would coincide nicely with an intro class. Throughout the rest of the book, Noricks discusses interview tips, attire and questions, job titles and salaries, the best fashion PR agencies and schools in the country, and more. Noricks taps into some valuable resources: first hand advice from fellow PR professionals, former interns, and fashion bloggers. A student considering a career in fashion PR will be comforted to read a testimony from Kelly Cutrone of People’s Revolution and Leah Jacobson of Elie Tahari. 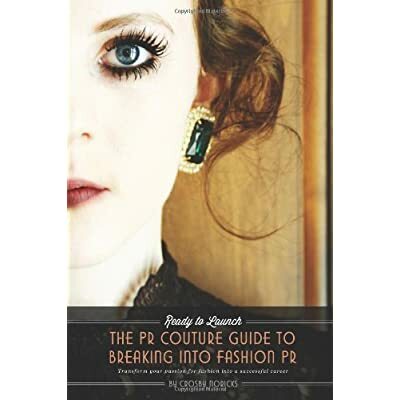 If you are a student considering fashion PR as a career, add Ready To Launch to your must read list. I tore through this guide in less than a day, and as a fashion blogger, even found myself learning from Noricks and her journey to fashion PR it-girl stardom. Christa is a graphic designer who dabbles in social media and public relations in the non-profit world. She moonlights as a fashion blogger and you can find her blogging about all things fashion here.